In 2014, Townsville City Council launched a detailed flood mapping service. The maps will allow people to search individual properties to find out the risk of it being inundated during a one-in-100-year flood event. Five years later and they’re publishing inundation maps. Sadly, new suburbs were built with the wrong expectations. If we had better climate models, perhaps we might have been able to empty the dam before the downpour instead of during it. (Though I’ve yet to see any data on dam levels yet, so perhaps not. Wait and see.). The Local Government Guru must be flummoxed. He (Hallam) even protests they used the “Monte Carlo” risk analysis “as recommen­d­ed in 2012 by experts.” What could possibly go wrong? Beware, people who followed the expert advice have no legal recourse to get compensation if they’ve just “discovered” it was built on a floodplain instead. In the global warming parallel universe there won’t be compensation: no climate modeler could even afford to pay back 0.1% of the damage created by those expert predictions. Inhabitants from the slide-rule-era built a kind of house on stilts that suited both droughts and flooding rains. 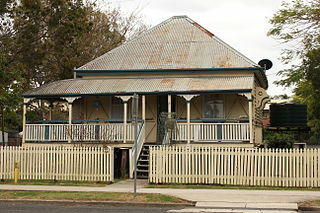 It was so common, it was known as a “Queenslander”. After the Brisbane floods the ABC even featured an article lamenting the lost art of the old architecture: “Have we forgotten to build for the wet“? For those from foreign lands, Brisbane is also in Queensland, but is 1,300km south of Townsville, outside the tropics, yet still prone to droughts and floods too. Best wishes to those suffering at the hands of monsoons and or models. Martin Clark: The State Govt forces councils to plan for the UN IPCC RCP 8.5 (worst case “global warming” scenario). This has been an exceptional event, but it is NOT unprecedented. There is a swale at the rear of my property. I have a marker placed at the level where the 1998 flood reached. The flood water has gone way past this marker four times in the last 6 days. The flood mapping may be partly based on expert engineering analysis, but the provisions are augmented by the lunatic projections of the UN IPCC’s RCP 8.5. This is called up in the State Planning Policy, so it MUST be incorporated in local planning provisions. This has resulted in some ridiculous requirements. I objected to RCP 8.5 being included in the SPP. Much to my surprise, it was removed, but was then put back in by the current regime. It is a distraction that can’t happen, but diverts attention from events that can happen. There are areas downstream of the Ross Dam that have flooded many times before, and will flood again. In this respect, Townsville is better than many towns and cities on the eastern seaboard, in that it is built at the estuary of rivers that have a limited catchment, not the 1/2 million km2 that applies to many other places. However, stuff that has been approved and constructed under the post-2014 provisions has gone under. Bunnings at Idalia went under by a whole metre. The ’98 flood was the result of a spent cyclone sitting over the city for about 24 hours. This has been a monsoon trough that has stayed almost stationary for 6 days. “Australian Rainfall and Runoff” does not adequately cover events that don’t move. Up until quite recently, “monsoonal” weather was regarded as something that only applied to India and SE Asia. As far as we know, monsoon troughs don’t go round for a second go like cyclones sometimes do. We hope. The only solution is to design for this type of phenomenon and where cost-effective, refit existing development to be recoverable. The money we waste on ruinable energy needs to be spent on real problems. “100 year” events? More like “100 week” events. Have heart, how could experts expect a monsoon? But the Tim Flim-Flam said there’d be no more flooding rains. And that Sydney Opera House would be underwater by 2000. And children in England wouldn’t know what snow was by 2018! 2: Staying better up to date with the satellites and the solar research. This is the tail end of the lead-in to the grand solar minimum. I remember reading on the Internet that 2019 would be the first year to show the real effects of global cooling with it settling in for real in 2020 through 2050. History has an unprecedented way of repeating.</sarc. Dr Phil Jones, of the East Anglia CRU said, in 2008 in an interview with the BBC that “cooling started in 2003.” First warning. There were cold winters across Europe and certainly in England in their 2005 & 2006 winters. Second Warning. There are liars, damned liars and experts. The judge, if he had known about twentieth century plumbing (being a citizen of the nineteenth century, how could he?) he might have thought of experts as X-Spurts where X is the unknown quantity and a Spurt is a drip under pressure. We need to keep that distinction clearly in mind. `Expertise’ is probably better regarded, as one Ph.D graduate realised on his Graduation Day, as a measure of what is not known rather than the other way around. I’m not making any claims of expertise, unlike Dr Lowe, but I would be sitting up and paying attention to The State of The Sun. In 2000, that’s three years before the start of the cooling in 2003, Dr Brian Fagan, an archaeologist and Professor Emeritus of Anthropology, University of California, wrote an interesting book about the Little Ice Age. To have the book published and prevent a massed attack from the Klimateriat, he had to write the `accepted’ weather causes for the LIA and leave out anything about the sun. Besides, the science of the influence of Space Weather (events on and from the Sun) on Terrestrial Weather was not even in its infancy around then. Whatever, the weather and the continuing disaster for humans over the five hundred years from 1300 to 1850 are not to be ignored. Animal populations increase during warm times when there is plentiful food. Humans are not exempt from that rule, not at all. England’s population was about 1.4 million by the late 11th century. It rose to about 5 million by the end of the 13th Century and collapsed over the LIA until it was less than 1.5 million by 1800. Our population has risen to about 4billion at the start of the 20th Century to over 7 billion now. There had been a poor harvest in a `Year Without a Summer’ in 1258 or 1259. Mass graves in London were recently discovered during excavations for a new building. Starvation was determined as the cause of death. That was tracked back to the Toba eruption in Indonesia. Why do we think we are immune from such? Yes, we survived Pinatubo but how many would survive Campi Flegrei? Or Yellowstone? Or Long Valley? Or Thera (Santorini)? They’re all rumbling, having very recently started to awake. Compared with those I’ve mentioned, Pinatubo is a baby. The Northern Hemisphere is having a hellish (the town of Hell in North America has `frozen over’ … see WUWT) time of it with more cold records being broken than anything else. This is the third savage winter in a row: Third, Fourth and Fifth warnings. About 1300 has been determined as the start of the Wolf Minimum and the end of the Medieval Warming. Fifteen years later, was the big rain. 2003 was the start of recent cooling (you will notice I’m ignoring all the temperature `fiddling’ engaged in over the last decade). It’s now 15 years later and there has been massive flooding around the world. Paris has been flooded with 2 100-year floods: 2016 and 2018. The Saudi Arabian desert has been flooded two years in a row. That’s a desert. Both times the Dr Lowes stood forth and sententiously proclaimed it to be Climate Change. There was a little cooling about 1910 after an ocean cycle switched state, and the Seine did a decent job of Paris. Coincidence? Perhaps, probably not. Yes, it is Changing Climate. The Sun is going into a Grand Minimum and to add insult to injury the Earth is now trying to swap its magnetic poles. The planetary magnetic field is changing so fast the compass variation calibration and adjustment had to brought forward a year. What’s even worse, is the rapid weakening of the planetary magnetic field. At the Laschamp change 40,000 years ago, it fell to 5% of its normal value. This time, it has lost 15% of its normal value, and the loss it accellerating, which allows the Solar Wind to wreak more damage to our weather by penetrating the upper atmosphere deeper than it otherwise would. There is absolutely nothing we can do about it. Giving up coal will do nothing. We now know the solar wind creates Topical Cyclones and other Extreme Weather events so our weather is going to be more extreme than it ever has been. If so much money hadn’t been wasted on elaborating CAGW and Climate CHange and had instead been spent on real climate research, our experts might have far better knowledge than they presently have and we might have been able to be warned by people with real and effective knowledge and we might have been able to plan Liquid Fuel Nuclear Plants to rid ourselves of coal and its pollution and continue to enjoy plentiful and reliable electricity. Instead, we have 17th Century windmills and the Dr Lowes of the world who will stand forth, and portentously and pretentiously invoke their 17th Century superstitions and lecture us about our SUVs. Idjits, Boneheads and Fools, the lot of them. Yes it is Changing Climate rather than Climate Change. It’s the Changes you get when it’s cooling. We have so far ignored the warnings. So far, the Southern Hemisphere has been very lucky with its winters. That can’t last. How true but unfortunately the modern education system does not prepare graduates to become ‘experts’, in fact it appears to do the opposite. Way back in the dim and distant past, at my graduation we were told that we had now mastered the fundamentals of learning and now all we had to do was to go out and learn how to be an engineer. The other thing we were told was to never stop learning because there is always something we don’t know. Today, when graduates leave university they think they know it all, (they have been told that by teachers that have never worked in the field they teach and indeed think doing so is beneath them) and expect everyone will listen to them pontificate from a position of stupidity – but then this is the way of the UN Church of Climatology. And I’d like to add that the term ‘expert’ has become a derogatory term for someone that knows far less than the common man (or woman), being totally deficient in common sense. Pretty much in any modern day endeavour, the ‘experts’ seem to always get it wrong, very wrong indeed. My tradie mate reckons experts are drips under pressure, but in defence of the experts they may have been considering the Queensland centenary drought from 1760-1870. Expert = X-Spurt – X is the unknown quantity and a spurt is a drip under pressure! An “expert” can be defined as: Somebody who can do for $2.00 what the ordinary person can do for 20 cents. with most “experts” today it seems it should be $200,000.00 instead of $2.00! Lets see a technical assessment. The flood insurance map overlaying the flood map. That will tell us everything. For those with no insurance within the 50 year flood zone the question is how can we help them? “Why should we”, is not going to help. It is what it is, people do dumb stuff. There are plenty of Queensland coast households who have been asked to support dams can supply water to inland Queensland. Too many have refused. Now may be a good time to ask again. You can’t build dams, they rob the oceans of water! Easy there bemused … it’s only temporary, the ocean won’t notice. Honest! Steve Bracks told us that dams steal water from our rivers, and he must have been right. Right? Monsoon, Queensland? Chance in a million. An expert is someone who come from more than 50 miles away. How can an expert expect anything? An expert would know the weather can’t be “expected” to do or not do any particular thing. It does not obey experts, their models or any past history either. The best plan would be to simply take it as it comes. But that leaves the flood years to be a big problem so why not build the dams and drainage that history would demand plus a safety margin and be done with it? Instead they stick t prediction. As previously posted, build on a flood plain – get flooded. Nope. The modellers used Monte Carlo method to determine what areas would flood. By the law of scepticism it’s bull-dust. OK. So we haven’t yet perfected mind reading. “The Australian” 7 February 2019. Page 2. “‘We’re not God. We don’t have supreme knowledge. We only have the best science, the best knowledge we can have’ he said (Local Government Association of Queensland chief executive Greg Hallam). So, who owned the land that the dodgy maps cleared for residential development of ground-level homes? What was their relationship to the Townsville Council and the individual councillors? Any new top range Mercedes recently seen in the possession of Townsville councillors? What relationships existed between the Queensland Floods Commission, which made the recommendations, and the land developers in Townsville? OK. Par for the course. Then it’s just shear incompetence and stupidity. Business as usual. Don’t claim (and blame) “science” Hallam where none existed, blame incompetence. Or maybe even corruption. Most of them couldn’t spell theodolite. Well, now they have first hand experience with a water level. Err, isn’t a monsoon a wind? noun. the seasonal wind of the Indian Ocean and southern Asia, blowing from the southwest in summer and from the northeast in winter. (in India and nearby lands) the season during which the southwest monsoon blows, commonly marked by heavy rains; rainy season. Dont ya jus luv it? “If we had better climate models, perhaps we might have been able to empty the dam before the downpour instead of during it.” Surely a computer model which allegedly will predict the climate in 100 year’s time will not be able to predict the weather in a few day’s time. Weather forecasting should be able to do that with a reasonable degree of certainty, long enough to open the flood gates to empty dams, for example? Whatever, builders love building on flood plains. Nice flat ground they can throw up housing on and be out of the country safe on their Caribbean island before the floods and subsidence set in. Those builders could not get away with it without planning permission from government authorities, usually from local government councils. Lots of scope for brown paper bags full of cash. I lived (briefly) in Geelong in a very wet year. After lots of rain there was further rain on a Sunday morning, about 75mm in 3 hours (an inch an hour to those not yet on metric). The drains couldn’t take it all so the excess water rushed down the old creek, through the shopping centre built on that land, then down the nearby short road where it washed away all the road metal so the tarmac collapsed about 45cms. (18 inches) making it impossible for the residents to drive out over the concrete guttering without damaging their cars. It then flowed through a house** and down into the below ground level carport of a new block of flats. There was a large drain pipe there to the river, but as that was swollen it would only drain when the water level in the carport was quite high. So 10 cars were floated up by the water until they hit the roof (and each other) whereupon the siphon worked and they dropped down, until the cycle repeated again. The insurance inspector wrote off 7 off the cars within a minute, and, I think, the rest after estimates. **Parents were lying in bed and hearing the children laughing. She ran through the things they were not to do (go outside etc) until she asked what they were doing and was told they were playing boats in the lounge room. The little darlings had opened the front and backdoors and water was flowing through the (slightly) sunken lounge. They were putting their boats in at the backdoor and having races to the front door. Footnotes: The subsequent owner had a large concrete ‘garden bed’ built across the entire back of the block about a metre high and 2 metres wide. The water would have been diverted down to that same carport. The subsequent enquiry turned up that the former Mayor had given permission for building on the old creek bed, and on the new subdivision up the hill diverting their flood waters into the existing drainage (which overwhelmed it). Money was involved and so he was given a few years jail sentence. If it had happened today he would have claimed Climate Change and probably got off. Regarding little children playing, many years ago a friend had brought home a brand new Holden station sedan and while the family enjoyed a Sunday roast lunch he said to his wife that later in the day he would wash the new car. After helping with to wash the dishes he went outside and there were the two children with the garden hose, all vehicle doors open and tailgate, and inside dripping wet. We washed the car for you Daddy they said. Hello Kevin, haven’t seen you for a while. Welcome back. The CAGW and now Climate Change idiocies have absorbed and swept up so much of the world’s wealth that good research such as that into the Space Weather (the events and happenings on the sun) and its effects on terrestrial weather is difficult to maintain and advance. It was only in early December last year (2018) that we learned through a freshly published paper that the Solar Wind created Tropical Cyclones. (includes typhoons and hurricanes.). P Prikryl, L Nikitima, V Rinsin: Rapid intensification of tropical cyclones in the context of the solar-wind-magnetosphere-ionsphere-atmosphere coupling. Journal of Atmospheric and Solar Terrestrial Physics. 2018. It will take a lot more research before things can be forecast with any degree of accuracy. The rain over Townsville I’m picking was caused by a sudden uptick in solar magnetic activity. For most of the week before it started, the kP index (the measure of solar activity) was less than 1 but not quite zero. Then, over three days it kicked up to 3 then peaked at 4 for about three hours before fading away back to nothing, creating a geomagnetic storm. It then rained on Townsville. No forecast could be have been timely. The sun is a capricious monster (at c. 1,000,000 x the size of earth) it does what it wants, when it wants and how it wants. About the average warning we can expect is maybe 16 hrs or so, which is about the average time the solar wind from a solar event takes to hit our planet’s magnetic field. Future research could enable us to tell what will happen and maybe where, but I doubt it would be very likely to give any longer time to avoid it in. Apparently, the expert’s knowledge of relevant history starts some years AFTER they were born. Parish the thought that they would even consider events that happened years before they were born to be relevant. As a consequence, the experts believe, the gullible go along, and reality simply ignores such things. It functions as it always has: stuff happens without regard to the beliefs, wishes, government edicts, laws, proclamations, standards, best practices, or expensively created plans prepared by the experts. Yet, a simple Midwestern US farm boy (me) watched and learned the ways of the real world. He takes a look at the lay of the land and selects the high ground on which to build. He avoids building in a flood prone or heavy drainage area. At least not without taking the necessary precautions for staying dry during the wettest of wet seasons. The basic idea is that stuff ALWAYS happens and it is best not to be there when it does. So pay attention and stay out of the way ON PURPOSE. There I go again pushing that bothersome thing called reality. You can try to ignore it if you wish, but you can’t ignore it when it happens. Just wait long enough, and it will happen. I lived in a house like that in Stanley St. Townsville, in the 40s, after the war. It was higher than that, with the laundry & other useful areas under it. The allotment next door was vacant, because in the wet it had a small seasonal creak running through it. However when it rained in full wet season strength, that little creak was 50 Ft wide, & 3 to 4ft deep. Further down to the beach it ran under some of the high set houses, which must have been fun for the residents in the storms. The council had tried to corral this wild little creak into an enclosed 8Ft wide 5Ft high pipe down by Queens park. That puny thing couldn’t carry more than a quarter of the water in a heavy storm. Wonderful place Townsville, but you do need a sense of humour to live there. Many years ago I renovated and extended a old house on timber stumps approximately 1.5 metres from ground to floor level, an architect designed the extension and an engineer did the foundation design. He insisted on the extension being placed on timber stumps, I had asked for a concrete slab after checking the council flood map which showed my land was well above the highest flood level in Maryborough Queensland. When the Bobcat mounted post digger was boring holes for the timber stumps, the engineer had specified blue metal for a base for drainage purposes and concrete on top surrounding each stump, round river gravel was removed indicating that the house was built on a water course. Further investigation revealed a creek bed below that had been filled in before the original house was built. A few years later during heavy rain and floods a neighbour’s property slightly higher on the hill than mine had soil and grass washed away by a “creek” full of water. Fortunately the water did no damage to my property as the street drainage handled the overflow. There was no indication of the old creek on the flood map. The engineer also insisted on hardwood treated (against Termites) timber stumps for another reason, that there is a fault line running along the Queensland coast and therefore a possibility of earthquakes. A few years after my renovating as completed Bundaberg buildings were damaged by an earth tremor. The Townsville flooding of houses built on concrete “floating” slabs is a repeat of the Brisbane River flood where the same foundation was approved on new subdivisions by the council with no regard for the potential inundation. I wonder if hubris and greed dont come into this – local councils seem to think that because we live in the wifi age, nature is tamed and were all just a bit clever. Was money made rezoning flood areas to sell more houses? A lot of the problem where I live is folks blowing into the district from Sydney or wherever with zero knowledge of local flood history or dynamics. The uni-trained engineers have the same lack of local knowledge. Every flood is different, but they do share some common traits known best to locals. After the 1955 flood there was a mass exodus of houses being moved up onto high ground. Houses on the floodplain were required to be on stilts or on raised mounds, and basically most development there was stopped in its tracks. In the meantime the levees were further raised and strengthened to protect the centre of town. They are now about 20 feet high with sacrificial spillways etc. to divert water where it will do less damage. At least 2 or 3 times since 1971 those levees have almost been over-topped. Only luck saved the town centre. Thirty years after the big flood we had a generation ignorant of floods along with the influx of new chums, one of whom got onto the council. He decided that there would be no more floods because of the levees and pushed for housing development on the flats again. Luckily he was ignored as we have had another big flood since, but it shows what ignorance of local history and conditions can lead to. Ignorance combined with academic certitude breed arrogance, complacency and error. council with no regard for the potential inundation. And yet they go ape about a minor 2mm/year sea level rise, slapping on huge premiums and stopping building permits etc. Go figure !! Its a dumb, gullible world that we live in. Are you sure floating slabs are approved here? I’m not a builder’s aole but they were being built in SA when I was there and they hardly scratched the twigs off the top of the dirt. Can’t do that here. Even 2500 years ago we knew better. You’d think it was referring to today’s climate models and the unpredictability of a non-coupled chaotic system. Does the IPCC have a consulting arm? Don’t know, why don’t you consult them? There is an electric current between Earth and the Sun which constantly varies, which is another. Current can flow in either direction. (Why do we have thunderstorms? to maintain charge balance both externally and internally) Remember: the Solar Wind is a stream of charged particles, sometimes negative sometimes positive. Thats part of the electromagnetic connection through the Solar Wind to our atmosphere. But no real complaints with your thesis otherwise, so far. Always start out with the largest, most obvious factors. The hidden ones you mention are interesting but not so obvious to a novice weatherman like myself. two arms, but no legs to stand on. Modelling was a highly reliable process which allowed sense to be made of systems involving a great many interacting factors. My own experience was related to the complexities involved in the production of molten iron from iron ore, coal and limestone in a blast furnace. Further modelling followed the processing of the molten iron into steel in BOS and Electric Arc steelmaking plants. In each case, a series of chemical reactions involved allowed estimates of the ingredients needed followed by fine tuning during use of the system. Basically modelling allowed the great many interacting factors to be assessed and graded as being important or irrelevant under the circumstances. Those factors of nil or low importance were consigned to the “black box”. The process of identifying the important items and those for the black box is known as factor analysis. I give this outline to contrast Real Modelling with the political variant used in so called “climate modelling”. Climate modelling purports to give a link between atmospheric levels of CO2 and the atmospheric temperature when there is no scientific basis for it. The only real model of the Earth’s atmospheric temperature is a plot against time for the last half million years which shows ice core data confirming that CO2 levels are driven by temperature. Orbital mechanics is the driver of atmospheric temperature, not CO2. Other models from the UNIPCCCC purporting to show CO2 driving temperature are not based on any known science or engineering consideration. As with the UNIPCCC, the modelling of flood prone areas has two significant driving considerations: Control and Cash. If you owned significant areas of flood prone land, what would you do to enable it to be sold? Some models produce control, others cash, some give both. But they are not Models. The chemical reactions of producing iron from iron ore are fully understood. The parameters that the modelling is based on clearly understood. This is not the same with the climate. Only a few of the parameters that affect the climate are understood in any great detail. This makes successful modelling impossible. Yes, and those few factors which are understood do not give any pathway to predicting chaotic events essentially on the sidelines. The two major factors in the shorter timeframe are; the rotation of the earth and the solar energy. Together these lead to the very simple feature known as The Diurnal Bulge. This is a 24 hour model. Precession of Earth’s axis gives variation in the concentration of solar energy available leading to the Seasons. A 12-month model. We had a system of weather prediction which was very useful until it was messed up by our politicians under the guidance of the U.N. The orbital variation seems to be involved with planetary alignments (barycentrism). We had one in 1998 but I didn’t hear about anything from it. We’ve got another coming in 2027. It will be interesting to watch. Some people think it may be enough to nudge the formation of very cold summers and maybe even an ice sheet but I’m not so sure about that. Unfortunately the 1998 alignment didn’t coincide with weak SSCs (Sun Spot Cycles) but very strong ones, so that may be why it didn’t seem to have an effect. SSC 24 is one of the weakest cycles so far seen and SSC 25 is thought to be going to be no better. So it may be that the barycentric nudge in 2027 could become significant. I haven’t run any numbers myself but I have seen numbers from someone who has which suggest a TSI variation of not 0.1% but more like 24-26%. There is the little matter of the sun being assumed as non-variant whereas it is known by astronomers as a variable mainline star which could vary by up to 4% in output. (That’s not taking into account that its output has grow about 30% in the last 4+billion years, which adds nothing to the 150 years MAXIMUM they claim to have included). Even a 0.25% change in output would make nonsense of their “science”. And they don’t dare go back further e.g. 1816 “the year without summer” after Tambora erupted in 1815. Presumably the 4% is always up from a base level. It would be interesting to know how long a solar eruption takes to form, peak and end. Not talking about eruptions but about long term drops. Taken from the type of stars (mainline) and comparing their output, so 2% up or down. O.K. So it’s more like an average of the total output. I’ve heard so much talk about relating Sunspots to output. Sunspots darken the face of the sun but it’s not really significant. What is significant it the magnetic energy. Sunspots flare. It’s the snapping of magnetic linkages (the coronal loops) and they can release enormous amounts of energy. A sizeable sunspot can let off a significant flare, which creates a CME. A CME of suitable size hitting Earth in the face can take out power grids. Do the climate alarmism “experts” ever get anything right? “In the six hundredth year of Noah’s life, on the seventeenth day of the second month—on that day all the springs of the great deep burst forth, and the floodgates of the heavens were opened” – but not those of the Ross river Dam, apparently. What, is there some kind of climate change alarmist rally being held down there? Could there be a northern and southern climate change zone? Many years ago, “Queenslanders” were built in many places – including Newport, Kentucky, across the Ohio River from Cincinnati. I haven’t been there in 55 years, so they may be gone. I don’t expect city council critters understand much about probability – about as much as gamblers, maybe. And, I guess their experts were the same modelers that developed the climate models. Flood plains are not all that difficult to identify. Makes no sense to use Monte Carlo methods. You must be thinking of traditional Monte Carlo simulation. They may have adopted the new form, where the flood plain (or other variable of choice) is determined by rigorous methods too arcane to detail here. Suffice to say that it involves the developers and officials entering a nearby casino, running some models, and emerging some time later. It has been noted that the area of newly approved land is approximately proportional to the increase in volume in the officials’ pockets. Thanks for clearing this up. I have noticed that “officials’ pockets” are regularly expanding. Modeling flood zones? The modelers could have saved themselves some trouble and referenced two professions: the people who originally laid the railway lines did a nice job of intentionally putting the tracks out of all but the most severe floods, and; the area farmers have an outstanding knowledge of past floods: whose horse paddock got flooded; who couldn’t plant sugar cane, etc, and…who had to drive the tractors down the train tracks to get to the town pub for a beer. Standard physical geography ( I did some in my undergrad year) states that flood plains are next to rivers where the sediments are far and wide of it due to flooding (over Millenia). Yes we need a random model to predict that! Almost by definition plains are formed by flooding, aren’t they? River deltas certainly are. After the ’98 deluge that filled one of the city’s richest men’s house with mud, an Irishman I knew commented, “At home the rich people build on top of the hill”. Most of us aren’t rich and there aren’t many hilltops anyway so we must do the best we can. Ah Hanrahan, ye’re bein’ defeatist. A bulldozer can build a bonnie big hill in less than a day! The dam on the Ross River was at 65% at the start of the downpour. So, this dam was not in the same catagory as the Wivenhoe debacle where “Revenue” water was stored in the flood compartment. Methinks it would have took considerable pronostication to gamble on the downpour and dump water in the weeks prior to give enogh room so the gates didnt need to open automatically. Because the Bureau of Meteorology is focussed on climate change and predicting temperatures 100 years from now, it looks like they failed to predict the 100-year Townsville rain event only 2 days out. Management of the Ross River dam might have been different if they had some reliable advance warning from the BOM. Instead, flood gates had to be opened at the last minute, clearly adding to the flooding. But they have an Extreme Weather Desk. Jonesy – thanks for the link, and the dam stats. Perhaps it would be more realistic to say that if people understood the climate they would be able to predict which part of the longer cycle (drought or flood) we were in and water storage policies could be tilted accordingly. Home builders could be better prepared for extreme weather knowing hotter-colder/wetter-drier cycles before they start. Note that the dam filled [barely] once in the previous six years. At 65% the water would have been below the gates and there is no way they could have released any water that early. They did start releasing water a little before 100% and I suspect that would have been widely accepted as prudent but not really late. To call this a one in a hundred monsoon doesn’t do it justice. Townsville has been settled well over that time and it really is unprecedented. None of us will know but I doubt it will happen again in the next hundred. I see some multi $ lawsuits coming. Traffic is pretty chaotic too, two of the three bridges over the Ross are closed, I assume because the footings have scoured. The port access road, never meant for private traffic will be getting a lot of use. The voters of FNQ are repeatedly told to expect a drier, hotter climate because of their carbon (sic) emissions. > After the deadly result of the BoM/CSIRO to predict/model the 2011 Australian floods, choosing the “permanent drought” meme instead, and the obscene amounts of tax-payer funds involved, when will the 97% climate science be held to account or some sort of revision of the 97% science failures? “Large parts of Western Australia, most of Queensland and the Top End of the Northern Territory are expected to be drier than usual. Further south, the rest of the country shows no strong push towards a wetter or drier than average summer, which is a change for parts of the southeast compared to recent months. Queensland has already seen some extraordinary record-breaking heat in recent days, with summer yet to truly begin. “It just breaks your spirit,” sheep farmer Chris Blunt from Emu Swamp told AAP. The 68-year-old says he’s heard governments say “You should be farming by forecast”. “Well, we’d be broke in 12 months if we did,” is his response. > Broke, dead, and on the road to ruin with unreliables. Warwick’s blog points out the absolute failure of the BoM to warn of any likelihood of above average rainfall in this part of northern Australia…. Fitz and ahh gee argue we would all be dead if it wasn’t for models ? And I’m expecting Fitz to say the flooding wasn’t as bad as expected . Was the reservoir that was at one stage 250% capacity too full at the beginning of the monsoon season because the BOM kept on saying that the threat of El Niño was expected this year, even though the SOI was in neutral zone throughout last year and so far this year? Same problem as at Wivenhoe. Expecting a single dam to both water storage and flood mitigation. Conflicting purposes that will always cause problems. No. It was @ 65% when the rain came down. In Jan/Feb of ’16. ’17 & ’18 it was 15% to 30%. If the modelling was done by a qualified and registered engineering firm, they could actually be liable. The admissions of the Council could be quite awkward in court. I hope an enquiry turns up any truth. “Expert” is simply the password to the vault containing all of that lovely, juicy taxpayer-largesse. I use Monte Carlo to pick my lottery numbers. The averages are working out really well! I would be very interested to see how they did their modelling. That is always the difficult decision with these modern dams that hold “200+%” capacity. One would think that it would be reasonably rational to take a risk on both the drought element and the flood element to release any water above 100% particularly during the wet season. Half the time I suspect they are just not paying attention till it’s too late. Yes and they keep repeating the same response when the big rains come. Big rains will come again and again. People should know all this. So anyone living in a dangerous flood prone zone is not taking appropriate actions to avoid being impacted by floods. So the blame has to be shared between the residents and the government. Spangles there is this attitude afoot that Australia is going to become more droughty because of AGW, so every drop of water is precious. As Andy correctly points out, ‘same problem as at Wivenhoe’. This mindset needs to change and the authorities should release the water earlier to avoid flooding. What we know for sure is that the south east trade winds onto the Queensland coast become stronger with a blocking high in the Tasman Sea. This is a persistent anomaly which hasn’t be factored in. Yes, EG, and drought has always been much more prevalent than floods in the past so it is an unenviable decision to be faced with. Andy’s comment on Wivenhoe is right and in that situation they really were not paying attention. They went into a huddle when people complained that they dumped too much, too quickly early on and as a result they let it build up to ridiculous levels. That is true and the 1760s to 1870 in the Burdekin district is a standout. It feels like monsoon failure, but I’ll need to take a closer look. They started releasing water before 100% was reached. Soon after it was a case of fortune telling trying to decide how early to flood the city. There never was time to release water to prevent flooding. I honestly think there was sweet F A they could have done differently. Our local council sent to the community a report from an “expert” saying certain areas needed to be marked as flood zones. This is despite the fact we were near the highest point in the Sydney area. The community was very angry and many of us wrote back and the council retracted the proposals. Turned out the real problem was the storm water drainage system was not good enough to handle the excess water during heavy rain. Later they fixed that. Goes to show public pressure can and does work. Now only of the nation wakes up and sends a clear message to both major parties enough is enough about this emissions reduction crap, which is sending us closer and closer to a crash and burn scenario. The next federal election will be a great litmus test. Meanwhile, without informing the ratepayers, local government councils are cooperating to implement UN Agenda 21, now Agenda 30 with that buzz word “sustainability” being so often used. Agenda 21 is still current. It deals with local government. Agenda 2030 is more national orientated. Were areas flooded that were not flooded in previous historic floods ? Comments in The Oz this morning from the Townsville old-timers seem to suggest that these new areas were known flood plains in the past. That is what I don’t get. Someone has goofed up in a major way. ! More like: looked the other way. This is all a bit more complicated than it appears. I am no apologist for Townsville City Council. At present, and not for the first time, I am pressing for action on matters where TCC staff has been engaging in harassment, malicious damage and official misconduct. Ahh so that’s the main reason it’s flawed , they used climate change in their models and got all the data from BOM and the CSIRO ! Since 1990 the computer modelling became widely available. And now we have 30 more years of data. Run it through a computer, and you will get reliable 100-year maximums for anything. Run it through five computers, and you will get reliable 500-year maximums. Long live statistics. New methodologies come with inherent risks. Then thousands of possible “replicates” are generated using this data. Thing is that only a few of these replicates might pick up long droughts, and short extreme storms. The other method involves looking at past extreme events, of which there may be very few. These are then fitted to an “occurrence curve” and different storms for different recurrence intervals can be extracted. Again, because of the lack of data (somethings as little as 30-50 years of decent data, the error bars on say a 1 in 100 or 1 in 200 rainfall event are rather large. The method of design storms is also fraught with risks, because it is generally based on very limited data. The new ARR tries to recognise the bipolar state of Australian rainfall.. very little vs lots in a short time. There is still MUCH understanding needed, and bringing unfounded “climate change™” effects in will not help the situation. A good case in point was the Dapto flood late last century. It cause a whole rethinking of Warragamba dam spillways. Putting that one new data point into the fitted occurrence curve changed it significantly. Current, we have way too little data on extreme rainfall events to say anything with any degree of accuracy. Its not quite guesswork, but…..
Said to see the IE pandering to this nonsense. It has to be a political fix interanlly, Engineers just arent that stupid. Its just not enough data to make solid predictions of exact flows. In the case of floods in Townsville, I do have to wonder what clown thinks a statistical 1 in 100 flood is a reasonable level for residential building. Particularly when their have been 4 or 5 major floods in the last century. Couldn’t be bothered doing the maths, but iirc, that means something like an 18% chance of a major flood in 20 years. Is that really acceptable. ? Said to see the EA pandering to this nonsense. Rainfall data from BOM is reasonably solid, too easily obtained and too many people watch. Also , the people who put together that original ARR documents did it well before there was any political motivations to skew/adjust any of the data. EA is a political body. Even a casual glance at the editorial in their magazine will support this claim. And the home page has this piece of boilerplate cant in the heading message: “leaders in shaping a sustainable world” which stopped me in my tracks. Unfortunately, this is very much that case. Don’t worry, so called environmental engineers are big into it as are municipal engineers, power corrupts. It’s the hard science engineers, electrical, mechanical that do the math. Besides it doesn’t really matter The late and great Bob Carter said we have got to stop being myopic and making stupid assumptions about the weather based on unproven computer code, instead we need to plan for the usual chaos, hotter, colder, wetter, drier whatever happens. Myopia about global warming is making us blind to the real threat of glaciation. The mild cooling of the LIA killed half of Europe, and a repeat performance would require Australia, Africa and South America to step up and feed the world. Are we ready for that? No way are prepared, and less so for fake global warming rhetoric. I’ll say it again, the side effects of climate activism are truly evil. Fitz why do you need a computer to make a guess at something ? These are the reason that “climate change™” SHOULD NOT be included in the analysis. c) are using false models. Have you ever been involved in preparing a Standard? I was involved in several. The last was a doddle because the ‘consultant’ lost interest when no-one wanted him. The rest of us (who all knew of each other in the industry) bashed out a practical one in 3 meetings. Another took 13 years to be finalised and that was just an up-grade. I lost interest years before as it seemed to be a lunching club for public servants and sales managers on expense accounts (2 days in different States which appeared to show more interest in the newest ‘hot’ restaurant). Within a month it was withdrawn under threat of legal proceedings and I was ‘volunteered’ back as one of those expected to fix the mess. So there are Standards and Standards and IF the engineers used a silly one to design the drainage systems then they may find themselves facing legal sanctions. More likely the decisions were made over their heads. As usual, pfutz, you are clueless what you are talking about. The old version of ARR was based on the best understanding of rainfall systems at the time. The new version of ARR has 30-40 years extra data, and shows patterns of rainfall that were not apparent in the original 1990′s data. It does allow for expectations of future climate to be included, but it is not mandatory. Any reasonable engineer will ONLY work on historic data and its analysis, without including any unproven garbage from climate change models. Its called acquisition of knowledge. You should try it some time. ! So with better data, they have changed their model. The original was based on the best historical data they had at the time, and now with extra data they have to update the model. The reason is climate change. Remember that this model covers Australia, it is not the Alice Springs Model or the Townsville Model. If it wasn’t climate change why would they have to change the model, one which had been working for the last 40 years? The new data just shows up more of the NATURAL VARIABILITY. There is NO EVIDENCE of “climate change™” except in unvalidated climate models. You are yet again showing your gross ignorance. AndyG55 you post all the time about how the temperature has not changed. Yet those engineers in the same period see changes significant enough to change their model. if the climate is unchanging as you say there would be no need to change the model – thus the explanation that it is climate change. You have so little comprehension of ANYTHING that you may as well be a monkey. Are you braindead or something, or just being your normal TOXIC self. and trolling for attention. Those who really want to see how storms and floods etc were estimated can download this document. it is NOT a settled field by a long shot. What don’t you comprehend, dumbo !! I am getting a bit over the continued abuse. This one poster has called me, clueless, a moron, an imbecile, aan a dumbo, on this one thread- he has no evidence for any of those statements and they are uncalled for. I am getting a bit over pfutz’s continual trolling for attention with his propaganda nonsense. Be has shown time after time that he really doesn’t have a clue, and is intentionally trying to remain that way. His DELIBERATE non-comprehension of basic realities. Either he matches every one of those definitions of his intellect, or he is DELIBERATELY trying to be a clown/troll. I’m also sick of his DELIBERATE fabricating what others have said, twisting to suit his agenda. This can only come from a toxic desire to troll. Post FACTS, pfutz, not copy paste from propaganda articles. btw, Have you found ANY empirical evidence of warming by increased atmospheric CO2, yet ? Among the many important considerations in the 2016 update of the ARR guidelines is its information on taking into account the influence of climate change. “Human induced climate change has the potential to alter the prevalence and severity of rainfall extremes, storm surge and floods,” ARR warns. Nothing there about natural variability. You are one of the thickest people in the world. You really are totally CLUELESS. again basing all your mindless yapping on a propaganda press release. Grow up and start to use your brain, for one. I repeat, for those that actually want to know the FACTS. The new version of ARR was instigated because NEW DATA showed that the old methodologies were rather inaccurate vs reality. The re-write was actually being considered well before all this “climate change™” nonsense became the political agenda. Computer synthesis of long term replicate data, based on HISTORIC data, and stochastic modelling procedures that were not available previously, have also been added. .. but in the political environment, I guess it was bound to happen. Those how CHOOSE to remain ignorant of these facts, that is their choice. They have already shown that they wish to remain, always, deliberately and toxically ignorant. “The new version of ARR was instigated because NEW DATA showed that the old methodologies were rather inaccurate vs reality. Again, with your chronic lack of comprehension. !! WOW !! I suggest you stop digging. You are already in well over your head. Or you could just keep up your mindless trolling. I know which you will choose. Do you have any empirical evidence of warming by increased atmospheric CO2 ? Do you have any empirical evidence of increase atmospheric CO2 changing the climate in any way ? … are purely down to NATURAL VARIABILITY. Hey Fitz what does “Empirical estimation mean” and how does an estimation prove something ? See Fitzy it’s garbage disguised as science like this that the IPCC use , the fact you can’t see or realise or even understand your masters have lied to you means you swallow up this rubbish and pretend it’s evidence . I’ve not looked at all links just the bottom one but if there all the same meme all it proves is just how gullible and easily lead you are . 6. ” Modelling studies suggest that … blah blah…..
8. “The model used here allows “…..
Models are NOT empirical evidence. And seriously, why bother lining to some low-end modelling junk that has nothing to do with anything. Answer so far is a resounding NO. you know, like solar based ocean warming and weather events..
are totally and completely NATURAL. 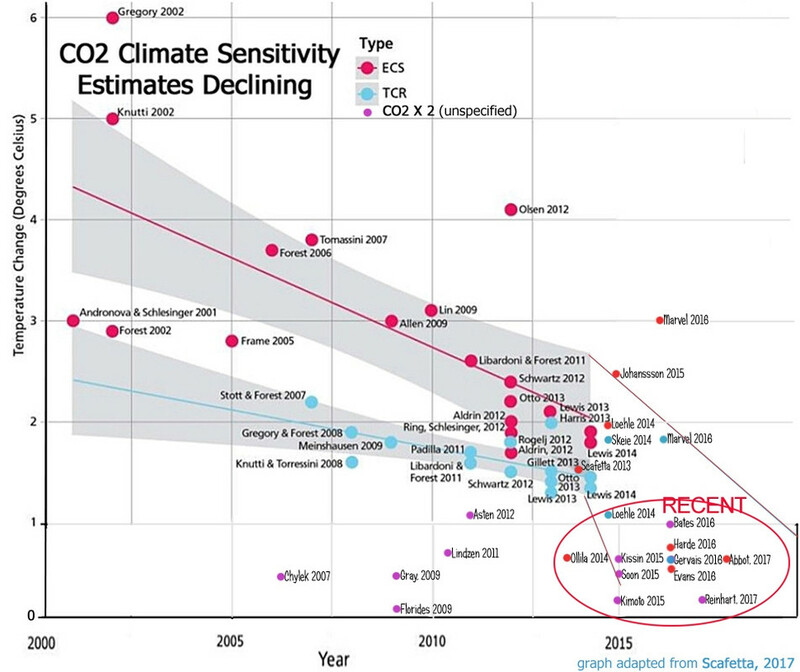 Let’s have a look at the “estimates” of “climate sensitivity” over time. As more and more understanding is gained of reality, the lower the estimates drop. Wouldn’t surprise me if the real sensitivity is actually slightly negative. No variability in climate, on what planet. Not OT , Climate change was to blame for the floods and all fires . The scaremongering seems to be ramped up . ***7 Feb: Reuters: Alister Doyle: Last year was fourth hottest on record: outlook sizzling – U.N. The Associated Press Health & Science Department receives support from the Howard Hughes Medical Institute’s Department of Science Education. Same old Greenist uninformed ‘deplorables’ being ‘deplorable’ Pat. But I suspect I will wait a long time. I notice today Breitbart refers to Washington Post as “the far left Washington Post” which suggests we could adopt the usage “far left ABC” although I should caution that wsws.org refers to Breitbart as “fascistic”. Serp I’m stealing it , The far left ABC . Yeps .LOTS of COLD records broken in the US only this last month !! That’s it! Break out the winter weather gear. If the UK’s Met Office is forecasting warmer temperatures, based on their dismal performance with long range forecasts over the past two decades or so, we can therefore expect temperatures to plunge like a peregrine falcon locked onto a pigeon. Where is the bitter cold? The rant about (fake) hottest year ever (each every year adnauseum) is ridiculous as this millenium is the COLDEST in the last 10000 years, therefore when it was allot warmer say 3000 years ago, civilizations collapsed thrived (Egypt etc. ), so what evidence do you (the alarmists) have that shows we will endure a collapse of massive proportions if it is warmer (again)? [which it isnt going to be for quite a while]. Yes, and if you look at the trend line from Minoan to Roman to Medieval to Nowadays, it’s downwards. It’s aimed at all you flat earth , coal loving , climate change denying deplorables . In moderation for using the first three letters of the alphabet and propaganda in the same sentence ? Unlikely – sometimes comments get held up for flaky reasons. They usually appear somewhat later. I have had it happen a few times here and on WUWT. Couldn’t be the link surely. Got it , the link contains the word hollow cost . Your opinion on climate science is worthless, even only as a front-person. ABC propaganda.. even more worthless. I couldn’t read it all. I find the ABC’s attitude very offensive. Yes Annie and Andy the ABC have gone full r-etard on this story and it just reinforces how anti science and in bed with the Greens they really are . Oooops! Another international non-entity speaks up in Geneva. Apparently the end is nigh if global temperature reaches 3deg. by 2100. This one is a Finn called Petteri Taalas . Anyone heard of him? In the drought of the early 80s I’d decided to get away from the Christmas crowds at Myall Lakes by using the low water levels to tour the lakes’ edges, walking and wading where it would not have been possible a few years before. I ran into a bloke with a yacht who invited me aboard for drink. Turned out he was a Newcastle hydrologist. He told me that all their work and prep during the previous decade had been geared toward flooding, as there was a general belief that climate had changed and that a wetter regime would prevail. Whoops! Climate does change, in lines and cycles, and it changes quickly and a lot. Can’t do anything else. No matter how much education you give someone, they either have a sense of context and perspective or they don’t. Surprisingly, those most skilled in science and maths often have less of this sense than the general population. Maybe it’s God or Nature’s way of levelling but I’m often amazed by how very brightest person is also the most literal-minded extrapolator in the room. Mind you, a scientifically gifted person with a sense of context and perspective is a pearl. If you can catch one of them, it’s a keeper. Sorry for being O/Topic … anyone heading to the Peterson (and Rubin) events in Perth Friday & Saturday? The missus and I will be there Saturday. It was so popular they had to put on the second event on Friday (same ‘problem’ in several other cities). The media has been quiet so far, but I expect the MSM and ABC will be lining up attack pieces for release in the next couple of days. I’m booked in for the Peterson/Rubin event in Melbourne on the 27th Feb. Are any other Jo Nova denizens going to be there? Looks like the leftist student bodies will be out to protest. Might wander down tonight to have a look at their silliness. Mate of mine sent a picture of Isaac Butterfield with his arm around Peterson – yes they are both in Perth with sold out shows. Any more details Beth? I didn’t know about this! There must be funding available from somewhere,lets call it the monsoon model study to evaluate the survival rates of models with very long legs and those with short legs? THE Bureau of Meteorology has been slammed for “woeful” forecasts during Townsville’s horrific flood event as the Queensland Premier warns “it’s a big journey back” as the massive clean-up begins in Townsville. Sister wanted to build a Queenslander, not allowed, too unsafe. There is little similarity between a “Queenslander” and a pole home. The natural environment for the former is in suburbia, the qtr acre belt, while for the latter it is the five acre belt, upstream on sloping ground where they chop down as few trees as possible. There could me more of this sort of event due to …solar hibernation = wild jetstream movements and precipitation, rain between the tropical zones and snow elsewhere at temperate latitudes. One source suggested the possibility of the sun surface temperature going down to around 4000K from the present 5500K. That is a big output fall. This last 1000 years has been the COLDEST of the last 10000, cooler than the Eemian interglacial 120,000 years ago. Blaming all recent extreeme cold (in the NH) on a polar vortex caused by …warming is plain bovine droppings. It is notable but NEVER mentioned that for both the huge 2011 floods in Brisbane and these now in Townsville, that the Weather Bureau totally failed to forecast these colossal events or even to predict rainfall of any significance to the areas. If the models have ANY credence (which of course they don’t) one would have thought that the conditions preceding such events would also have been extreme and therefore easily recognisable. One feature which they were far too busy using to demonstrate global warming, was the very hot December/January which preceded these events. For someone who lived by the rain (a grazier in North West Queensland and whose family had been there for about 70n years, hot weather meant future rain and lots of it depending on how hot!!! The distribution of the hot places is also of course important in determining where the most rain might be. None of this simple observation seems to me to form any part of the modern modelling and I believe the forecasts from charts made by human assessment fifty or more years ago were far more accurate than anything we see today. Having said that, I don’t think any amount of accurate forecasting would have made one jot of difference to the people of Townsville where we lived also for thirty years. People would not have known exactly how the floods would affect them and would have remained complacent enough not to even try to protect their properties. In any case, the most vulnerable properties were really unprotectable. However, my indictment of the incompetence of the bOM remains intact!!! Am I alone in thinking that they missed one – the one that has just happened? I wish I knew where everyone here lives where nothing bad ever happens. I live in Townsville but have never been flooded. I have never been threatened by bush fire. Only ever had one break and enter in my life. The worst damage from a cyclone is one window pane. $400,000 buys me a nice home close to conveniences. 20 min drive to launch my tinnie. The GBR is “out there” if I really wanted to swim/fish it. I don’t own a jumper and spend less on aircon than you southerners spend on heating. I live in jeans, only wearing dress slacks to funerals and weddings. Must be 30 years since I’ve worn a coat and tie. I no longer own a coat. Someone on another thread said Townsville should never have been settled, not knowing that it was an important port long before a road or rail existed to the north. Collective noun for “experts”: A calamity of experts.